Last week Silicon Valley Bank saw a lot of me - two afternoons in a row at events they sponsored. The 'Technology on the move' event in their Tasman Drive offices was worth the time. Good reviews of the silicon systems in cars from Simon Segars, ARM; and Taner Ozcelik, NVIDIA. Their components are used not just for entertainment and navigation, but also for instrument cluster replacement (the 'glass cockpit') and crash and engine simulation systems. NVIDIA's parts are in more than 100 models of car, and ARM's in very many more. A panel discussion about electric vehicles focused on what it would take to have EVs be the primary household vehicle. Better battery life and higher petrol prices are part of the story - so is an incentive for drivers to understand their actual day to day requirements, rather than needing to own a vehicle which is only used to its full capacity during a long summer vacation drive. Mark Platshon, who set up BMW's venture fund, ran through a future scenario where his calender was connected to his car, enabling advance reservation of parking spots close to meeting locations and suggestions about proximity of colleagues, friends, and restaurants, to illustrate the sort of things in which i-Ventures is investing. This wasn't discussed at the meeting - what I really want isn't so much a particular car as Transportation as a Service - being able to drive myself, or be driven, or take public transport, or have things delivered, as something for which I pay a subscription. All the technoloy to do this exists, but the APIs don't. It would take capital, and interaction with very disjoint transport providers - the Bay Area can't even operate a one ticket system for the different (and very poor) rail services. Expect something like this to emerge in one of the Scandinavian cities first. Didn't attend in person, did listen and watch most of the broadcast material. The quality of the broadcast received was noticably better than for previous Nanogs. Andy Bechtolscheim did the first morning keynote - he's good at presenting a lot of reasonably sophisticated technical material without obviously promoting Arista. If slides are posted, they will be on the agenda page. Moore's Law will continue to hold through 2024 at least, and probably through 2031. It will soon be possible to buy flash memory chips with 1 terrabyte of capacity. Networking speeds have not kept up with either the increasing density of memory nor the increasing capability of CPUs. The bottleneck is in the offchip communications - throughput per device has increased about 10 times in 12 years. Manufacturers have been using ASIC workflow for networking chip development - now there's sufficient demand for 10G ethernet components to justify custom design flows, laid out with a specific clock target. Expect reasonable pricing and volumes of 40GE components in 4 years, and 100GE in 8 years. The other issue holding back mass adoption of 10GE has been the cost of the external optical connections to the fiber used for connecting top of rack switches to the aggregating routers. (Connections from servers to the ToR as short enough for copper). The original IEEE standards didn't support an inexpensive standard for the 100m - 300m distance. Silicon photonics on parallel single mode fiber is changing that - 12 duplex channels in 4.5mm, MTP/MPO multifiber connectors - expect parts commercially available in 2014. For the 'best' performance, have to decide if the goal is minimising latency, or minimsing packet drops, and consider the details of the TCP stack(s) in use or available. Switching paths through single chips using SRAM minimise latency; chips using less expensive off chip DRAM can have much bigger buffers. Tim Pozar described some of the politics and technology involved in having a non-profit build network using City fiber with City oversight. It's still work in progress and they'd like more help. As one of the lightning talks, Ed Crabbe, who talked about Google's use of Openflow at the last Nanog, presented a short form of the talk Urs Hoelzle gave at ONS. They use their own hardware routers, run a minimal embedded OS on them, including BGP and ISIS from Quagga. There is a global broker/scheduler, non standard transport protocols, demand is tailored to be deterministic. There was a lighting talk, then a full presentation, about the possible consequences of the ITU deliberation due to take place in December 2012. The Internet as it currently operates has many cross border collaborations in place. Proposals from country governments for much more UN regulation are likely to interfere. Most of the contributions from this panel were worthwhile listening to. Comcast has a proposal for a new address family for BGP in a single AS, since content caches perform better if they know something about the network they are in. Dave Tempkin from Netflix described the CDN they are making available. The talk on BGP route origin verification using reverse DNS had the most people passionate about it - it could have done with a lot more time for questions and discussion. Substantial network with 100G wide area network links across the US. Good diagrams of the network, and explaining 100GBase-LR4 . Advanced Networking Initiative, ANI. They built deliberate routing loops for testing. Jim Martin from ISC describing progress to date on BIND 10. the first try was "a miserable failure"; it's been tested some more since and is back in production on AS112. Will be ready for user testing in October 2012. Patrick Gilmore from Akamai with statistics from Akamai's monitoring showing recent (an hour ago) and the gradual build up of IPv6 traffic on World IPv6 Day. 9 Aug 2012 Editing to add - video was posted on the agenda some weeks back - look for the .wmv files. Heavy Reading are selling a write up on photonic integration - there's a useful list of system and component vendors available without paying for the full report. Having been to the last 3 years of Engage Invest Exploit, the event run by Informatics Ventures (University of Edinburgh) where the startups which they support present to investors, I couldn't make this year's event. Michael Hayes from RookieOven posted his summary. Since there isn't a handy list of exhibitors with their URLs, I've made one. We've talked to some of these companies on previous visits; we'll review the others and add some of them to the meeting list next time we're in town. Now that the list for the most recent entrants into the 500 Startups accelerator has been published, it's time to offer congratulations to Scott Allison, CEO and Founder at Teamly. He and I met (via Twitter) when he was still in Glasgow, contemplating moving to London, and he's achieved a lot since then. He's also contributing regular articles to Forbes - the latest on what it takes to get accepted into the 500 startups accelerator, for nine of the twenty seven new entrants. Silicon Valley is still the best place to grow a 'eyeball' business - one which has potentially millions of customers, whether consumers or enterprise. You can start that business somewhere else, and probably should, since somewhere else will be cheaper - but if you want to scale it up and to compete with everyone else selling to the English speaking world, the Valley is the place to do that. It has the investors, it has the accelerators, it has the lawyers, it has the people who've done it before, all accessible. To get to the Valley, the company needs to show some success , and have some resources with which to do that - 500 startups, Techstars,and Ycombinator, are accelerators - you have to have something to validate their investment of money and time in you, and you are competing with a tough, global, crowd. Well done to Scott and Teamly for having made it this far ! Be awesome at work; stay focused, collaborate better, and celebrate your achievements. One of the more interesting infrastructure themes currently getting attention and investment is Software Defined Networks. The ambition is for there to be a simple network control plane, with clearly defined APIs, enabling changes in network operations depending on the priorities of the applications currently using the network. The post collects my notes. Updated 3 May 2012 to add summary from Google keynote at the Open Networking Summit in April. IBM white paper (May 2011) describes IBM and NEC Openflow demo at Interop 2011. "The OpenFlow Protocol allows entries in the Flow Table to be deﬁned by a server external to the switch, which creates the potential to unify server and network device management. For example, a ﬂow could be a TCP connection, all the packets from a particular MAC or IP address, or all packets with the same VLAN tag. Each ﬂow table entry has a speciﬁc action associated with a particular ﬂow, such as forwarding the ﬂow to a given switch port (at line rate), encapsulating and forwarding the ﬂow to a controller for processing, or dropping a ﬂow’s packets (for example, to help prevent denial of service attacks)." Nanog 54 - the most interesting panel at San Diego (6 Feb 2012) discussed Openflow, standards work in progress, and one approach to implementing SDN. Quoting Ed Crabbe (Google) on why Google is interested in SDN - it sees an opportunity to improve cost control for their infrastructure while maintaining performance. SDN has been around as a concept for a long time. Ipsilon GSMP, 1996; Cambridge's The Tempest, 1998 and so on down the years. Flowspec in 2008 looks like openflow, too. IETF PCE, 2004, based on having RSVP-TE deployed, ISIS, etc. From network element software side, it's more complex, but it's deployable today. Do new protocol development fast; right now, takes too long to get new protocols into devices. IBM announced a distributed virtual switch (5000V) 14 Feb 2012 supporting SPAN, ERSPAN, Ethernet Virtual bridge, load balancing, ACLS, etc, integrated into VMware. Alex Bennet (Battery Ventures) "This is an important development because as the first tier of network switching moves into the server, the virtual switch becomes extremely strategic real-estate and control point for emerging SDN architectures." "OpenFlow has helped us improve backbone performance and reduce backbone complexity and cost"
For the WAN, aim is to have cost per bit/second go down with scale, as for CPU and storage; without a lot of systems engineering, that's not what actually happens, since network complexity goes up; also, a 100G bps interface costs a lot more than 10 x 10 gbs interfaces, or 100 x 1G bps. Google are operating the WAN backbone carrying traffic between data centers with centralized traffic engineering. They have a simulation environment for testing "with the complete system, end to end. Everything is real except the hardware". Building a software defined WAN results in higher performance, better fault tolerance, and lower costs. Conclusion : Openflow and SDN are ready for real world use. Last Wednesday, 1 Feb 2012, was an all day mentoring session for the finalists in IBM's global Smartcamp competition. It was held at the old Federal Reserve Bank building in the financial district in San Francisco. Mentors, of which I was one, spent 40 minutes with each team, having first listened to their pitches. IBM provided a summary of each company. My notes on each are in bold. If you are interested in more background, contact me at info@cunningsystems.com . Bitcarrier is the leading provider of real-time traffic information for smart cities. Its patented Bluetooth and Wi-Fi scanning technology provides very accurate and reliable traffic information in real time. By collecting locations from an average of 48% of target vehicles in real time, Bitcarrier has created the biggest database yet of citizens’ travel behavior. This information is the basis for decision-making regarding new infrastructure or mobility policies, such as the provisioning of public transportation, but it also has unlimited potential from private companies in services/applications they could provide to clients and cities. Stored and managed in Bitcarrier’s private cloud, the data collected becomes valuable information about congestion generation, the origin and destination of travelers and commuting times. everyday problems. Bitcarrier’s vision is shared and used by cities such as Barcelona, Rio de Janeiro and São Paulo, and by some partners like Telvent-Schneider Electric. Barcelona, Spain. Selling to highway toll operators - limited market - and to city governments in places which have little existing traffic control infrastructure and do have money. This means mainly Latin America. They aim to become the communications platform for other infrastructure status information. These activities are performed automatically, with no need for expert intervention, and provide clear, actionable results. The company has leading customers such as Proctor & Gamble, Kimberly-Clark, Applied Materials, Lely, Cellcom, Tnuva, Delek Group, Strauss, General Motors, the European Community, and several intelligence agencies. ConnectMs vision is to be a leading energy management solutions provider leveraging BI and analytics across telecom tower and building infrastructure. assurance. ConnectMs Energy management solution for commercial buildings monitors, optimizes and controls energy systems (e.g., lighting, HVAC, UPS, etc.). in commercial buildings in India, with an installed base of 3 million square feet of office space, ConnectM delivers annualized energy savings in excess of $4M (U.S.) to current customers, including leading Indian firms as well as global MNC companies. $6m funding in 2007 (Crunchbase) from IDG Ventures India (media biz, venture fund) and Sasken. These people need expansion capital, not venture - they have a repeatable installation and ROI model. manufacturers and retailers make better decisions. We allow them to strengthen their marketing initiatives, raise their product conversion rates with instant results, and improve the overall shopping experience for consumers. Selling paid pilots to retail associations - groups of grocery stores, where one will be the pilot and the others will follow on. Some government funding. Sales process is 4 - 6 months. Localytics offers the most powerful application analytics platform; giving mobile app publishers for iPhone, iPad, Android, BlackBerry and Windows Phone 7 the tools they need to build more successful and profitable applications. Localytics provides the only real-time service, session-level detail and data access demanded by top application publishers. Pricing Free; $100, $1000 /month. These people don't necessarily need any more capital - they are doing very well both in traction and in revenue. Palmap is a pioneering indoor mapping and POI open platform. Palmap aims to redefine indoor maps and bring new values to mobile users walking inside buildings rather than those driving on streets. We are seeking a breakthrough for the popular LBS applications, where our smarter, super-detailed maps and POI information will greatly help mobile users with indoor activities such as navigating airports and shopping. Based on Palmap’s innovative indoor GIS engine and open APIs, LBS developers could build numerous creative and interesting LBS and SNS Apps such as check-in, store locator, around-me search, location-based games, etc. Palmap incorporates the cutting-edge technologies of GIS, cloud computing, mobile computing and sensor networks to help make our planet smarter. Not locating individuals on maps in real time - providing (very detailed) map information to partners, who may. Gathering information by sending paid groups to malls, airports; also by crowdsourcing for updates. Has raised money from China and Hong Kong. Jacky Zhou (formerly Baidu) just joined as Chairman. Profitero is a next-generation pricing intelligence service for retailers and manufacturers. The company helps clients to increase sales and maximize profits by leveraging high-quality online competitive data at scale. This allows businesses to react quickly to changes in their competitors’ prices. Some of the world’s biggest retailers already use Profitero pricing data. Retailers and manufacturers have found Profitero’s data essential for pricing strategy, forecasting, ongoing price management, merchandising planning, product promotions and market/brand positioning. The technology currently monitors 27.5 million products across 2,500 European retail websites with plans to grow this to 100 million products in 2012. Suited to online and brick-and-mortar retailers and manufacturers, Profitero’s easy-to-use web dashboard application can readily compare accurate pricing data across grocery, drinks, health and beauty, household and electrical goods – including A-brands as well as own-label lines. Development center in Belarus. These people won the competition. and sensing capability significantly improves the safety of the nation’s water supply by ensuring a continuous stream of high-quality water. The sensor can be deployed in multiple units to create a network of interconnected devices, while reducing costs by replacing manual testing, providing 24/7 coverage, eliminating costly cleanup of water utilities and eliminating costly regulatory fines. All of these solutions solve demonstrated pain points our end-users have identified as needing a solution. Our proprietary software and its easy-to-use GUI interface can be integrated into municipal water facility control systems, allowing automatic and timely system protection and cost-savings. Web site needs a couple of case studies, from viewpoint of operators and purchasers. 1m pitch vid shows wireless transmitter, pictures of green algae. Self funded so far, could do with venture investment. Have licensed exclusive patents from Oak Ridge National Labs. No hint at a business model. Do they know about the Edinburgh/Cambridge study ? 2012 is shaping up to be a mentoring year. Complementing the Cultivate Companies work, I'm being a mentor for Techstars Cloud, which is running in San Antonio until April. The first face to face meeting with the seed companies there is later this week. At the beginning of February, IBM runs its global final for SmartCamp - nine companies from nine cities, each of which won a regional final. I'm one of the mentors for the global final event in San Francisco. Blog posting has been sparse, though those of you who follow @annejohn will have seen occasional reports about Scotland from a couple of weeks back. With Tom Willey and Richard Marshall, I was in Edinburgh and Glasgow to meet people and talk about Cultivate Companies. What we are aiming to do is to take advantage of geographically separate demand and supply - in Scotland (and elsewhere) there are smart people developing interesting technology, but funding sources are limited and have a low risk appetite. In Silicon Valley there's a shortage of engineering talent, and many sources of investment. Cultivate Companies aims to match scare resources with demand. 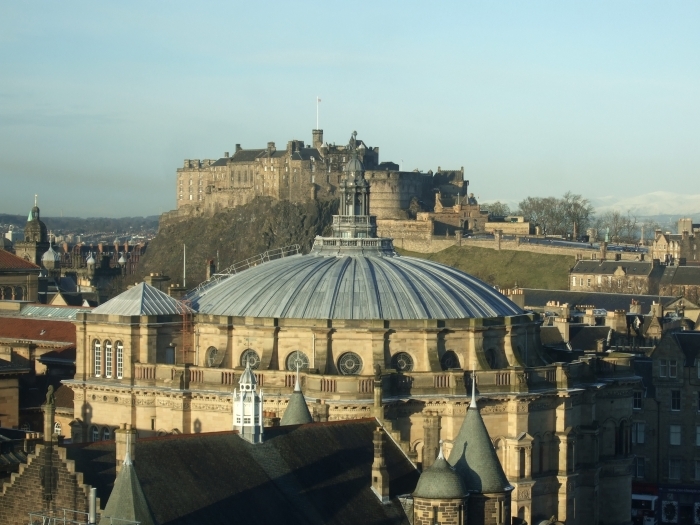 Here is Edinburgh Castle, with the McEwan Hall, taken from an office with one of the better views in the world. Techstars is a startup accelerator - like Y Combinator, except that it isn't in the Valley; it runs in Boulder, Boston, New York and Seattle. In January, the first Techstars Cloud will run in San Antonio, Texas. Entry is competitive; "TechStars will select approximately ten companies focused on cloud infrastructure to participate. Chosen companies will receive seed funding, mentorship from many of the world’s top cloud infrastructure thought leaders, and will have access to perks available only to TechStars companies and alumni." I'm one of the mentors for the Cloud event; accordingly, I participated remotely in Techstars for a Day, which ran on Saturday 5 November 2011, as a sort of introduction. In addition to running a video feed from the venue, there were several Google+ Hangout sessions, with a machine in a room next to the main hall in the venue (inside the hall would have been much noiser) and up to 10 of those of us 'attending' remotely participating in the hangout. Several of the applicants introduced themselves and talked about what they wanted to do if they were selected. Some people had camera and microphone issues on their end; the chat session was useful for checking on background and asking who did and didn't have signal. For me, the audio and video quality of the hangout was better than the audio/video from the Techstars.tv feed. Next time, there should be scheduled time slots for applicants to pitch to mentors; everybody learns from listening in to the others. Since San Antonio will be my first Techstars, I picked up context and background which will help me be more useful more quickly in the early January sessions. Since Dave Ward's presentation on Software Defined Networks at Nanog there's been a lot more of it about. SDN feels a lot like MPLS (Multi-protocol label switching) did when it was first introduced - it appears to simplify the operation of the network without actually doing so, and it gives the industry a 'big new thing' to talk about and compete over. Ivan Pepelnjak thinks so too - he's enthusiastic. So is James Hamilton (Amazon).